It is not often Aurora Australis are visible from as far north as a place like Western Australia, but it does occasionally happen. 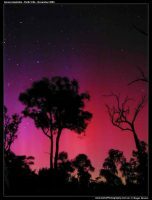 October 2003 – Bright pink aurora visible from Wheatbelt WA (Narrogin), would have been visible to Perth latitudes. 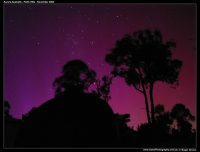 November 2003 – Bright green and pink Aurora visible from Perth Hills, extending so far north that the constellation of Orion was washed out with pink. This means the Aurora was extending overhead. 9th March 2012 – Bright aurora visible from Perth Hills but washed out by the full moon. Could have been equal to 2003 if not for the full moon. 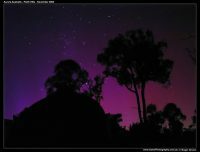 20th February 2014 – Faint red aurora visible on the southern horizon from Perth Hills. 18th March 2015 – Aurora visible from Perth Hills but I missed it 🙁 Display seems to have been similar to 9th March 2012 or October 2003 but at New Moon this time. 22nd – 23rd June 2015 – Aurora visible from throughout southern Western Australia including the Perth metro and hills areas. Photographs show green near the horizon and pink above. To know if Aurora Australis are going to be visible keep an eye on the “K index”, a measure of space-weather activity. If the K-index rises to 5, 6 or 7 (or above) you are in with a chance of seeing Aurora Australis from Perth! Find the K-index at the IPS Space Weather page. Also keep an eye out on Ian Musgrave’s blog, as he’s on the ball with aurora forecasting! You can also keep an eye on SpaceWeather.com and combine your knowledge from all sources to give you the best chance of finding an Aurora. Another useful source (which the aforementioned sites use) is NOAA space weather. It takes some interpretation to apply the information from these sites to your actual location and current conditions. The best place to view Aurora Australis from Australia is south, as far south as you can go with clear skies. In Western Australia this means places like Albany or the south-west Capes region, if the weather is clear. Aurora are sometimes visible from as high as Perth and even higher as my photographs below illustrate, but it depends entirely on the circumstances at the time, and involves an element of luck. If you live in Perth and are keen to see Aurora, and know the coming night might be good, driving or flying south or south-east is your best best. Aim for dark skies (country location away from city) as far south or south-east as you are happy to drive. I say south-east because in WA the light pollution (and population) tend to hug the west coast. To photograph aurora you will need a tripod and reasonably sensitive camera (any modern DSLR would do). Use a long shutter speed of several seconds or more (try 15 seconds), and a high ISO (800ISO or higher). Zoom out to have a wide field of view and use a fast aperture (f/2.8 – f/4). A cable release/interval timer is useful. Be mindful of the lens fogging up due to dew/moisture. Experiment with exposure times and ISO. To view Aurora you will be looking for pillars of light coming from the southern horizon. Some times when I have seen the Aurora in the hills of Perth I have initially mistaken them for the spotlight of kangaroo shooters in the bush, looking like a spotlight beam extending up from the southern horizon. It is only when a photograph is taken that the colour usually shows. Bright aurora do have visual colour but it is subtle at high latitudes like Perth. In Perth I have seen pillars of light extending from the southern horizon overhead to about 20 degrees north of the zenith as evident by my photograph of Orion with Aurora Australis below. To see when I get new aurora photographs and keep up with when I post an alert, I suggest you follow my page: https://www.facebook.com/astrophotographyaustralia and I will post pictures at Astro Photography Australia where I sell photographs of aurora and other astrophotography. 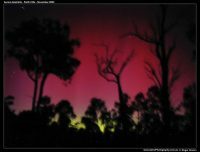 Aurora Australis – October 2003 from Narrogin in the Western Australian Wheatbelt. 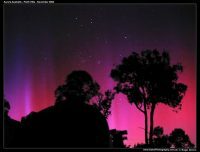 Aurora Australis from Perth HIlls – November 2003. Think Aurora Australis aren’t visible as far north as Perth? 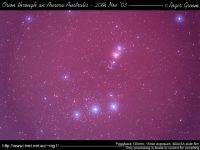 Think again, this photograph shows the beautiful pink glow extending far enough north to swamp the constellation of Orion, as viewed from 31 degrees south. Photograph of Aurora Australis with the Magellanic Clouds, startrails around the South Celestial Pole, and beautiful crisp silhouettes on the horizon. Aurora Australis photographed in the hills of Perth, 9th March 2013. This was photographed during full moon, hence the bright blue glow to the sky and horizon. the Aurora are visible as pink pillars extending from the southern horizon. Aurora Australis 20th February 2014 8:15pm – 9pm. So faint it was not visible to the naked eye and not even distinguishable on the camera screen. This is a stack of 10 frames combined. Flicking between each of the individual 10 frames the moving pillars of pink are evident on the south horizon.